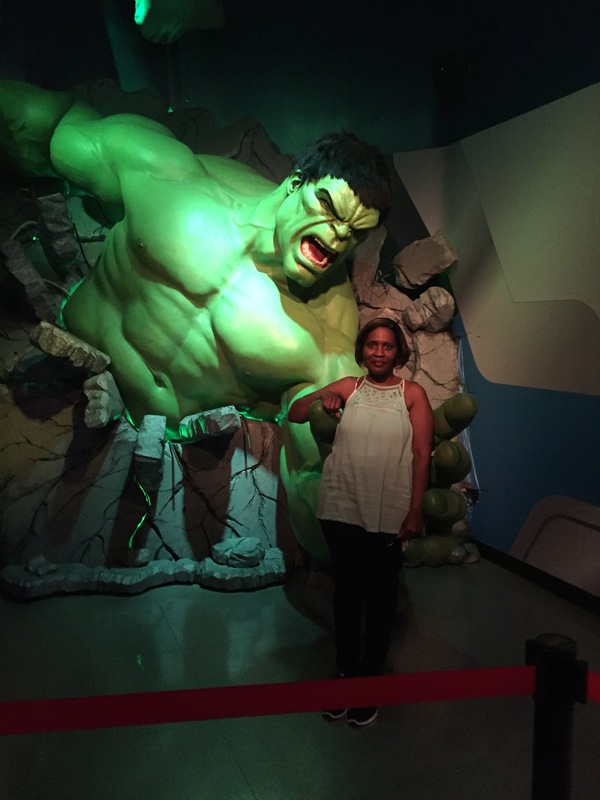 The past week has been hectic with work and other crazy life stuff. I did manage to get in some quality sewing time to finish a UFO and work on a couple of new projects. The rail fence quilt block is an old traditional block that is super simple to construct. Looks great with all fabric themes – modern, solids, 30’s reproduction prints, civil war, etc. I love the rail fence quilt block because it is jelly roll friendly! I used the RJR Redwork meets Bluework roll of 2.5 inch strips to make my rail fence picnic quilt. The prints in the roll were red, white, and blue making it perfect for us to use at our local patriotic festivals. I used the thick but soft Blizzard fleece from JoAnn Fabrics for the backing and did not use any batting. I finished the quilt as a blanket; no binding. I did quilt it with a large meandering stitch. The quilt measure 54 x 65. Using left over charm squares from a project last year I made a couple of pillows to match. I quickly took the hst scraps and made the star block. Pillow on the left I made using my embroidery machine. I still needed a table runner for May and found the tutorial Stars and Stripes from A Bright Corner online. I was able to make it start to finish in two hours. If you like applique or just learning how to applique this is a super project. Directions are great. My runner measure 13 x 36 inches. My new project for the week was using sashiko, which is a decorative form of stitching/embroidery from Japan. When Martingale had a sale on ebooks over the holidays I purchased Sensational Sashiko by Sharon Pederson. This book has beautiful quilt projects featuring Sashiko designs — so many of them I hope to make. There are templates in the book if you want to do hand embroidery , and also a list of sites of where to purchase sashiko machine embroidery designs. Using the machine embroidery option I made place mats and mug rugs. I used a heavier 35 weight rayon thread to give it a more authentic look. The stitch out is absolutely beautiful, you can see stars and diamonds. Each is a single design with a continuous stitch. The placemat sashiko design is 8 x 12 inches and the mug rug sashiko design is 8 x 8 inches. The beauty is the front and back are identical! I can’t wait to start one of the projects from the book. It’s the end of October, time to pull out my GO BLUE Michigan sweatshirts! We’ve had a couple of chilly days here in MD. Fall is my favorite time of year. I love the colors of the leaves as they fall to the ground – the deep hues of orange, yellow, green and red are so comforting. Fall is synonymous with football in our house — my son played football for University of Michigan beginning in 2006 and graduated in 2010. We still follow the team as if he were still playing! Gotta have some quilty goodness to go along with football — right?? 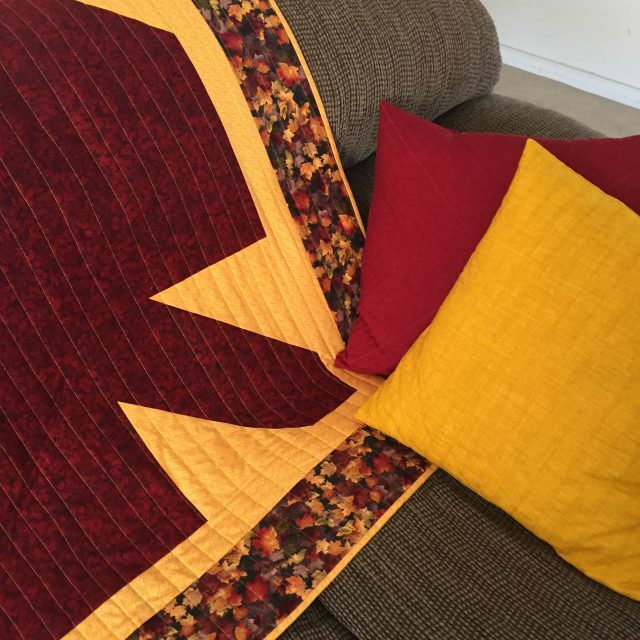 I made this supersized maple leaf quilt last year. Not really large enough to snuggle under but perfect to throw over my legs while watching games on TV and/or reading. I practiced more walking foot quilting with pillows to match the quilt. The yellow/gold pillow I used a decorative stitch from my machine, the burgundy pillow, I marked a large X and echoed each quadrant. It was my first time using a chalk pencil — I didn’t test it — and it didn’t come out until several washes later. 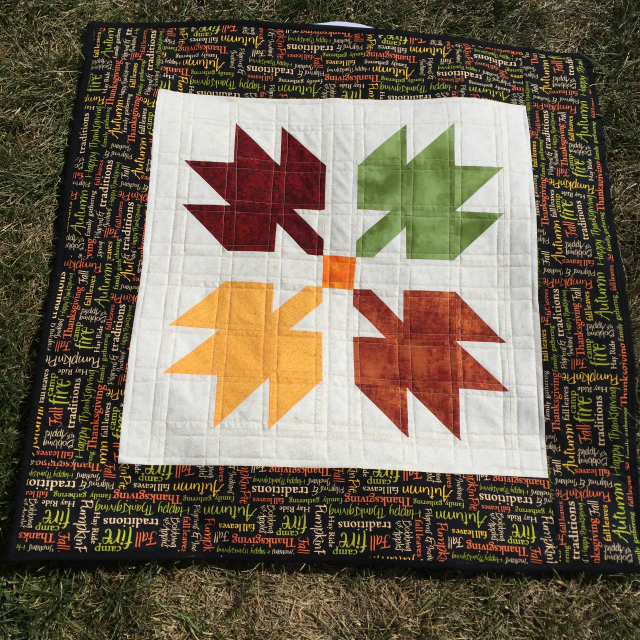 If you are interested in seeing a great video tutorial for creating the maple leaf quilt block, check out Amanda from 3and3Quarters.